While living in Sonoma County on these four acres of land at the end of a dirt road there happened to be, as mentioned, a lovely apple orchard at the entrance to the property. This gave me the opportunity to learn about tending to twenty-three trees. 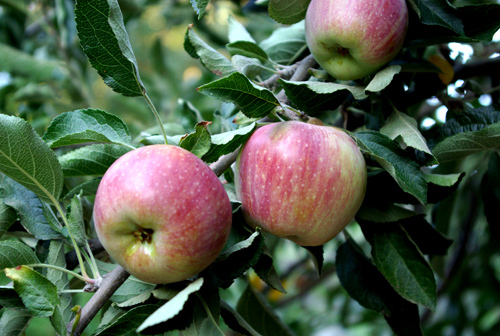 During my first winter there, there was an early freeze and subsequently not that many apples emerged in the springtime. Imagine my surprise when in the second spring each tree’s limbs hung towards the ground under the weight of hundreds of apples. A full crop. What to do? In the beginning I diligently and happily climbed a ladder and picked blemish-free apples and mailed a large box to my parents and a large box to my daughter, being careful to have them approved by the local agricultural office before putting them in the mail so as not to unwittingly introduce some hidden menacing bug into another territory. They were always pronounced as fine. Then there was the round of picking for my own self. My canaries loved the abundant fresh organic fruit. Next an offer to neighbors,many of whom had their own trees to harvest. I felt the urgency to share the abundance and my good fortune. I began feeding apples from the ground to the donkey and horse next door, whose fences ran across the edge of my property. They joyfully complied and I discovered that they began to do all their daylong grazing along my fence-line in hopes that I might emerge and toss them some fallen apples. Their owners hardly saw them! The apples continued to ripen and fall. What to do? I decided to call every food relief society within a two-county range to see if I could get someone to come pick the apples for hungry families. Sadly, I could not find a single agency who felt they had the manpower and /or insurance coverage to come pick apples for needy families. I heard from one of the agricultural experts that coddling moths would be making their homes happily within any apples on the ground. One morning I gathered an entire orchard’s worth of fallen apples from the ground and put them in the recycling bin. Gone. Apples continued to fall. The horse and donkey and canaries burst with apples. I bought a dehydrator. I dried apples for Christmas presents, after dipping them in lemon water and cinnamon and sugar. Yummy, but very time consuming. What does one do with so many apples? Where does it end? I had apples in boxes on the back deck. I had apples in the refrigerator. I had apples in bowls in the kitchen. I took apples to my grandmother’s nursing home. Must I do something with all of them? Very unexpectedly a new critter appeared on our hill. A lovely blonde mama coyote with her baby. She loved the apples. She was hungry and had a new baby to feed. By this time the end of the season was nearing and apples stubbornly clung to branches, withering. I begin to shake the trees allowing the last apples of the season to fall. I left them for mama coyote. 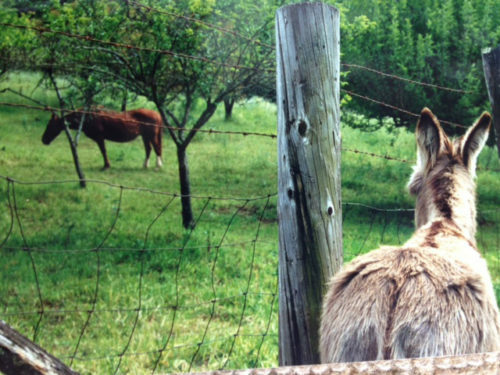 I advised both Cheyenne the donkey and Reno the horse that all subsequent apples would fall to the mama and her babe. But Cheyenne protested vociferously. She bucked. She brayed. 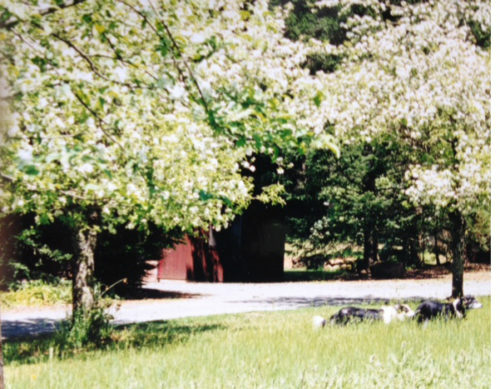 She tossed her head and loudly hee-hawed as each morning I would walk to the orchard with my dogs and not feed her. Most mornings we would see mama coyote scamper out of the orchard into the surrounding pine forest. So the season ends. And I realize that I am not obliged to make good use of every ripe fruit on the vine. The Earth and its inhabitants will naturally recycle what I am not able to use. It will be someone else’s joy and benefit. I can count on a master plan. I realize that life offers us myriad choices and that as we say yes to some, and no to others we might feel we have missed out on something, or that others, like Cheyenne, might protest loudly at our choices, feeling abandoned and not understanding. Choices we must make, however, and trust that whatever is left behind will serve a fellow being. This is an excerpt from Kathryn’s book Plant Whatever Brings You Joy: Blessed Wisdom from the Garden, which is available on Amazon.com, as a Kindle e-book at Amazon sites around the world, and at various indie bookstores around the country. Book and Blog News: Lovely news! 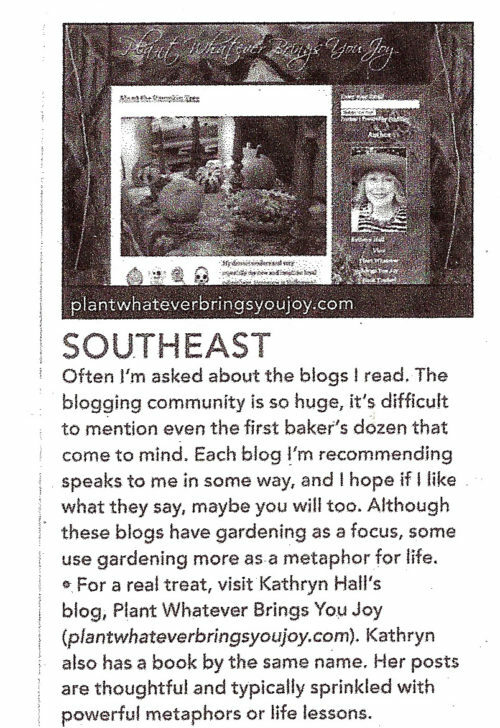 Gardening blogger/author Helen Yoest has kindly included Plant Whatever Brings You Joy blog in her column in the spring issue of Country Gardens Magazine Many thanks to her! Words of wisdom, always inspiring. Hi Kathryn. That is a nice post 🙂 I love your attitude and congrats for making such an effort to spread the apples! I’m envious of your orchard! 🙂 I would have likely tried to make every apple count too. I wish I have an orchard like yours, I love apples but we buy them in the market and grocery stores. Hi, I just stumbled onto your lovey blog while researching wild violets. I too tend a garden sanctuary on l/4 acre in a suburb of Chicago. I love the title of your book and it is what I often advise beginning gardeners, or when asked “how do you get all the garden work done?” my response is “what work? It is all joy, or I don’t do it.” My question is where are you located? I can’t tell from a quick perusal of this site. Thanks. Apples, apples, apples. In the fall I have too many too. I usually gather up buckets-full and take them to the woods for the deer, moose and bear and whatever else is interested in them. By the following week, the apples are all gone and the munchers are ready for another feed!